How bad is it for the Democrats? Stacey Abrams the party’s choice, and Bernie Sanders… Who they apparently permitted to give a response because he succeeded in making Stacey Abrams look sane by comparison. Of course, that one’s a very close call, so the Democrats had to go after Bernie as a racist and a sexist for doing so, to give Abrams that little extra boost. But, it’s all for naught. Both CNN and CBS ran polling data showing a 75% approval rating for the contents of the speech. And that I think is precisely why people like Nancy Pelosi, and Maxine Waters and Chuckles Schumer were down playing the speech before it even happened. They knew the moment he hit the podium, they would lose. 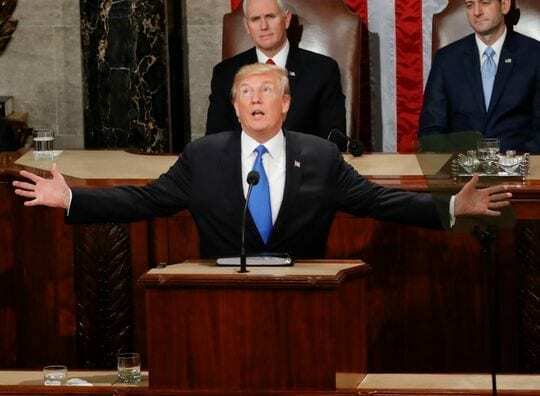 President Donald Trump’s annual State of the Union address won favorability with Americans as indicated by polls released following Tuesday night’s speech. The president started and ended with talk of security for the American people, and intertwined Republican policy with heartwarming triumphant stories of American people to keep his message flowing. That means more than 75 percent of CNN, one of America’s mainstream cable news outlets, approved the president’s message. Then there’s a CBS poll that showed at least 76 percent agreed with the president. According to this tweet from CBS News, at least 72 percent even agreed on the president’s immigration policy, which has been a major bone of contention over the most recent partial government shutdown. It should be pointed out since Newsweek has never been anything but a leftist outlet, and for them to admit such things, to say nothing of CBS and CNN, who operate in the same theater of the mindless, demonstrates clearly just how badly the Democrats have overplayed their hand. It’ll be interesting to see in the weeks ahead, if this dosage of reality has any effect on Schumer Pelosi and company. particularly as regards to the next impending government shutdown. Best part of the night? Watching Bernie Sanders getting slapped upside the head with reality. I also note that Nancy Pelosi deliberately did not applaud that line. That tells us right there what she is about. After so exposing themselves, and with the kind of poll numbers we’ve gone over here, the Democrats are going to find it difficult to marginalize Trump going forward. Advantage, Trump, despite the Democrats wearing their Klan colors. The question is will it be enough.